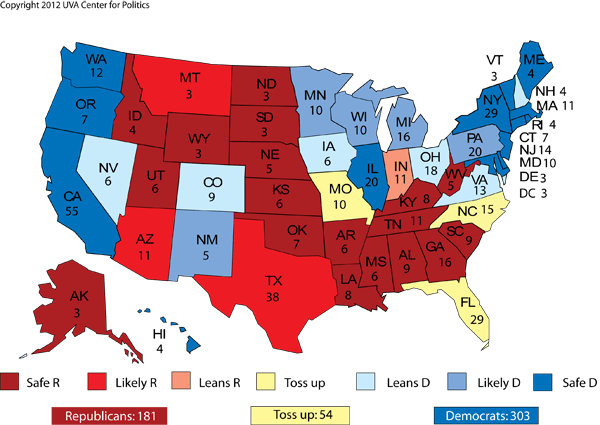 If you haven’t seen this map from Larry Sabato’s Crystal Ball, then you might be missing why the tide seems to be turning towards Mitt Romney. Sabato calls it a “Newt-mare,” a spin on the word nightmare. If Gingrich is the nominee, it’s not just the presidency that Republicans lose, but a lot of those seats they picked up in Congress in 2010. That fear may very well be driving people to link up behind Romney. I’d like to urge Republicans to support Gingrich 🙂 but I can’t. There’s simply too much time between now and November and anything could happen. The last thing I’d want is having this megalomaniac as president. I don’t get the sense that Romney is the authoritarian that Gingrich is. Obviously, I’d prefer that neither of them become president. Gingrich has the potential to be this century’s Goldwater. And I think that is why the Republican establishment has gone on the attack and lined up behind Romney. Romney might not be able to beat Obama either, but he wouldn’t be the disaster that Gingrich would. Neither would be the disaster that 0bama is. 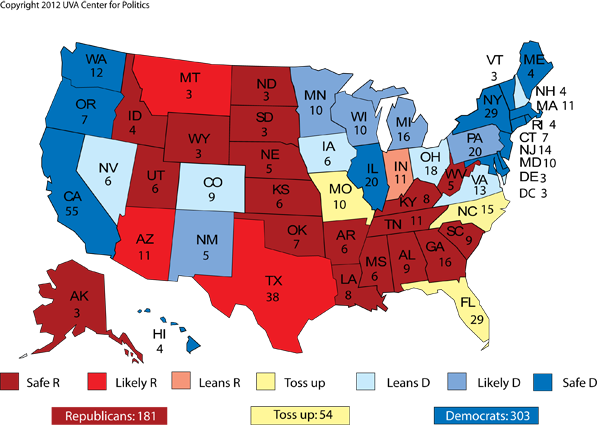 The key to this map is deeming Virginia a “Leans D.” Larry Sabato must be on drugs. And of course, any Republican who takes a Democrat’s advice on who to nominate is a damn fool. Look at the other map in the link, James. Virginia is listed as a toss-up there. Only if Newt is the nominee does VA lean D.
The elephant in the room is the money factor President Obama will enjoy between September and November. (Pun intended) Its all uphill for the GOP candidate. It’s always hard to beat an incumbent president, unless he’s alienated enough of his own party to draw opposition for the nomination (Carter, Bush 1…LBJ, although he quit rather than risk losing). LBJ was losing his party’s nomination. But the results of the November election probably would have been the same, a Nixon win.